I'm sitting in a hotel room in Omaha, Nebraska. I have stayed in Omaha many times before at my old airline....but this hotel is a bit nicer. Everything is nicer at American versus my last airline. I've flown about 60 hours total...but every airport I've flown to has been one I flew to in the past. Nothing new. The hotels are all better...and I get actual crew meals! This was a Frankenstein one off MD-80. 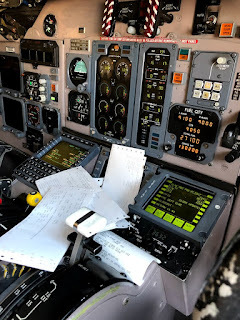 Digital Gauges from a legacy TWA MD-80, FMS from a legacy AA MD-80 and laser touchscreen ACARS from...some museum. I'm still the bottom guy on reserve...but driving to work means there's zero stress. I should have 9 under me by the end of April and 20 by the end of May. 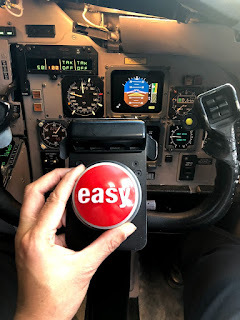 Flying the MD-80 is easier than I thought. Don't get me wrong there's a lot to do. My seat has been often described as the busiest seat in the airline. I still have many friends at my old gig. News isn't good. There's a severe shortage of Captains. The shortage is so bad that they've halted hiring any new hire that doesn't qualify for an immediate Captain position. They've also sent instructors back to the line to fly as there's such a shortage. And for those of you wondering....my easy button is still with me.